it's my girls' world: It's the little things-- like feet! ....Like teeny tiny baby feet. When I first got pregnant with Cassia and told the president of the company, Ed, he was elated. He spoke about the joys of parenting but then he broke into a smile talking about those little feet puttering around everywhere. Ed and I have always had great conversations (humble, hungry and smart, anyone?) but this one I remember most clearly. 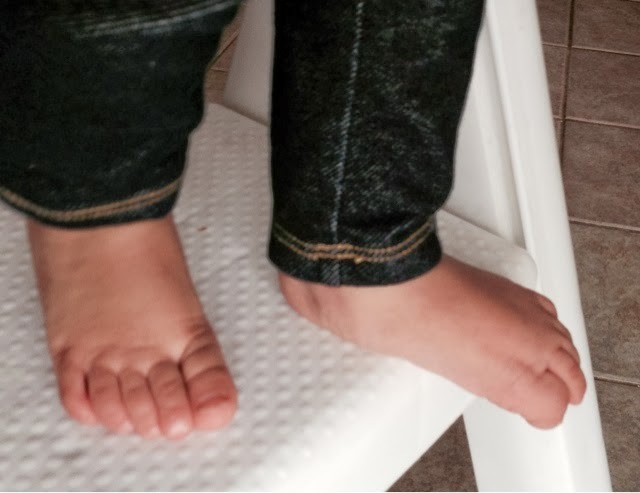 I just love my babies' feet. From the time they were born, those teeny tiny toes had me. From how they curled in, to the little dimples in them to how very chubby they are. The above is actually Cassia's newborn foot, my rings and Darin's hands... cool pic, huh? Two for the price of one... or is it four for the price of two?! I can't believe that I just wrote a whole post about feet! New link up today with Jess for "It's the Little Things". Also, I will not be blogging for the next two weeks as we head out to attend my cousin's wedding. But when I come back, I'll have loads of pics and stories to tell.